You are here: Home / About Farming & Food / To GMO or to non-GMO? To GMO or to non-GMO? How do farmers choose the type of seeds they will plant? 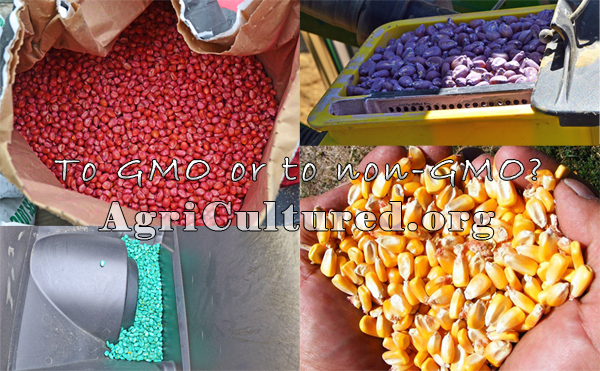 Every farmer has the choice whether he will plant GMO or non-GMO crops. The decision to plant GMO or non-GMO seeds is based on many factors, including the area of the country, the weather predictions, the soil types, the history (and future predictions) of pest problems, the cost of the seed, and the predicted sale price of the crop at the end of the year. Can you tell the difference between the genetically modified corn and the non-genetically modified corn in this picture? It’s tempting to say that the brightly colored corn is genetically modified, and the “normal” yellow corn is not. But that’s not necessarily right. The bright colors are pre-treatments that are applied to the corn seeds before they are sold to the farmers. The plain yellow corn has no pre-treatment. The pre-treatment might be a fungicide to keep the corn seed from getting moldy, or a pesticide to protect the corn seed from insects before it has a chance to grow. The color of the pre-treatment (or even whether the corn has had a pre-treatment or not) has nothing to do with genetic modification. Even non-genetically modified corn can have a pre-treatment applied to it. Genetically modified (GM) seeds cost more than non-genetically modified (conventional) seeds to. The technology comes at an extra cost. But the benefit is that these crops have traits that will help them survive better, need a little less attention from the farmer, a few less chemicals, and potentially yield more at harvest. Conventional seeds are still hybrids, which means that there are years of breeding that went into getting this particular plant. Conventional seeds do cost less than GM seeds. But it is likely that the farmer will have to apply more chemicals (herbicides and/or insecticides). This means driving the tractor through the field more, which means the cost of fuel, their time, and compaction of the soil from driving the heavy equipment over the ground. When farmers sell some non-GM crops (like corn) they are often paid a premium over what they would receive for selling a GM crop. For some farmers, the lower cost of seed and the higher selling price makes planting conventional crops a smart business decision. For others, the decreased input costs and less concern about insect pressure make up for the higher seed cost of GM crops. A farmer might choose to plant GM crops this year, but choose to plant conventional crops next year based on the type of soil he has, the new hybrids of conventional crops that are available next year, the weather predictions, or the selling price predictions. Regardless of which type of seed they choose to plant, farmers work long hard hours to make sure that we have food to put on our tables every evening for dinner.